(VEN) - Activities in the industry and trade sector in 2013 took effect, especially in supporting and overcoming difficulties for businesses and actively carrying out the Buy Vietnamese Goods campaign. (VEN) - New investment in production and improved European and American import demands for goods are expected to increase Vietnam’s exports in 2014. The Purchasing Managers Index (PMI) stood at 51.8 in December 2013, the highest index since April 2011. (VEN) - “Localities, sectors, businesses and the state’s preparations to open the domestic logistics market in 2014 remain desultory and spontaneous. The market is facing the risk of being dominated by foreign businesses,” Professor Dang Dinh Dao, Director of the Institute of Economic and Development Studies under the National Economics University, shared his opinion with Industry and Trade Review’s Anh Tuan. (VEN) - Vietnamese goods were good-priced and reliable, Senior Vice President - Operations, Global Sourcing at Walmart Ignacio Lopez said at a meeting with the Ministry of Industry and Trade’s leaders on January 6. (VEN) - Based on optimistic forecasts about the situation of the global economy, especially the thriving of large markets such as the US, the EU and Japan, Vietnam Textile and Apparel Association (VITAS) Vice President Le Tien Truong predicted that the Vietnamese textile and garment sector would have a bright future in 2014. (VEN) - Chinese-Vietnamese trade and investment cooperation has rapidly developed in recent years. China remained one of Vietnam’s major markets in terms of exports and was Vietnam’s biggest overall commercial partner in 2013. (VEN) - In the framework of the post-WTO accession Technical Assistance Program, the Office of National Committee for International Economic Cooperation launched a program on building economic integration indexes at provincial and city levels under the Improving management and coordination capabilities for international economic integration project to evaluate the developments and international integration capabilities of localities across the country. (VEN) - The global economy’s long recession in recent years has seen consumer demand decline, leading to decreases in agricultural product prices, while trade protection trends have continued to grow and climate change continues to complicate cultivation - all these factors have had a direct impact on Vietnam’s agriculture. 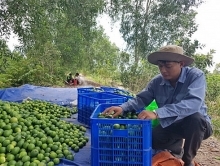 Despite these factors, the total export value of Vietnamese agricultural, forest and aquatic products in 2013 reached an estimated US$27.5 billion, a rise of 0.7 percent compared with 2012, with a trade surplus exceeding US$8.5 billion. (VEN) - With an export surplus of US$100 million in December, Vietnam recorded a trade surplus of US$863 million in 2013 accounting for 0.65 percent of all export revenues, making 2013 the second year Vietnam exported more than it imported.